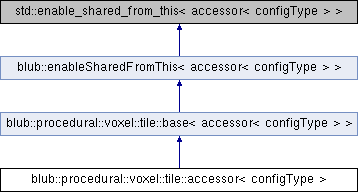 The accessor class caches all voxel needed by tile::surface for an extremly optimized and fast calculation for the same. This class looks up all voxel needed for the modified marching cubes and if lod is enabled 6*arrays for every side of the cube (transvoxel). See http://www.terathon.com/voxels/ and http://www.terathon.com/lengyel/Lengyel-VoxelTerrain.pdf. getNumVoxelLargerZero returns number of voxel not minimum. getNumVoxelLargerZeroLod returns number of voxel in lod not minimum. getVoxel return ref to voxel. getVoxelArrayLod returns nullptr if no lod shall get calculated else 6-lod-arrays of voxels. isEmpty returns true if all voxel are minimum. isFull returns true if all voxel are maximum. setCalculateLod enables or disables lod calculation and voxel buffering for it. setVoxel set ancalculateIndex convertes a 3d voxel-pos to a 1d array-index. returns true if anything changed. setVoxelLod sets a voxel to a lod array.